Dr. Sheila Robinson says her experience working together with a united team of women inspired her to found and publish Diversity Woman Magazine and create the Diversity Women’s Business Leadership Conference. That team united women from Asia, South America, and North America to create the Lycra® brand for DuPont, and brought together a sisterhood of diverse races, cultures and backgrounds. She said working together like that in one location generates a synergy and extraordinary power that is indescribable. Dr. Sheila’s purpose is to educate women that it’s okay for us to look different and come from different places. We all want many of the same things. We want a healthy happy family, opportunities and to be safe and successful. None of us will get anywhere if we undermine each other. When we put aside our differences and unite, we are amazed at what we can accomplish together. Dr. Nancy mentioned how much she enjoyed seeing the young women and men who attended the Diversity Women’s Leadership Conference for the first time. She learned so much about what inclusion and sisterhood really mean. Dr. Sheila said that she was grateful for the praise and that feedback from newcomers makes the work worthwhile. She stressed that it is not easy work to do, but this time, she was able to bring more female CEO-level professionals from major corporations than ever before. It has always been her dream to bring the c-suite women together with those just starting out to show them what is possible and that they can be leaders too. She recounted a story from a CFO speaker at this year’s conference, who said, “This is part of my ministry. I have things on my desk that have to be done, but I have to do this.” It’s that kind of dedication to helping other women that will escalate the equality needed in women’s leadership. Dr. Nancy described a chart she saw at this year’s conference: 65% of female CEOs said they achieved their success because someone told them they could do it. These relationships between women supporting and mentoring other women give both the mentor and mentoree the drive and spirit to accomplish their goals. Sheila said her own mother pushed her to do new things and women like Dr. Johnetta Cole and Dr. Maya Angelou, said, “Don’t stop the work.” These women told her she was on the right journey. 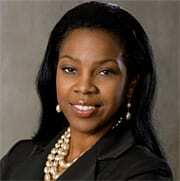 Dr. Sheila incorporated two themes at this year’s Diversity Women’s Conference. The first one was to be courageous, no matter what. The second was a saying that she has been repeating to herself for years. What people say to you is a reflection of who they are and what you say to others is a reflection of who you are. If they say something harmful to you, it’s up to you to remember that it’s only their opinion and does not really reflect you, unless you let it. She told a story about a supervisor at one company she worked for who told her she would never be anything but an administrative assistant in that company. She immediately thought, “This is not the company for me.” She would never have become Dr. Sheila Robinson, named one of the “50 Top Women in Magazine Publishing” if she had accepted that supervisor’s limited assessment of her. Listen to this interview to find out why Dr. Sheila says all women are leaders, and how she says to change your perspective about who you think you are. First, identify yourself as a leader, then as a woman, then as a woman of color or ethnicity, and so on. That way you keep any limiting biases from distracting you from your course. Check out her website and save the dates, Nov. 13 & 14, 2019, to attend next year’s Diversity Women’s Business Leadership Conference to find out in person how truly powerful coming together with like minded women and men can be. 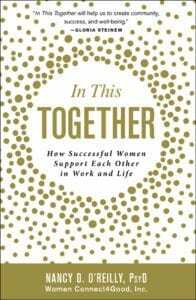 Sheila’s stories and guidance also appear in Dr. Nancy’s new book, In This Together: How Successful Women Support Each Other In Work and Life, along with thoughts, inspiration, and stories from 40 successful women across a variety of careers—from authors to actresses, CEOs and professors—encouraging women to support each other in the workplace and in life. Learn about action plans on how all women can work together to break free from the binds of gender inequality. Then remember to get your copy – and gifts for your friends.